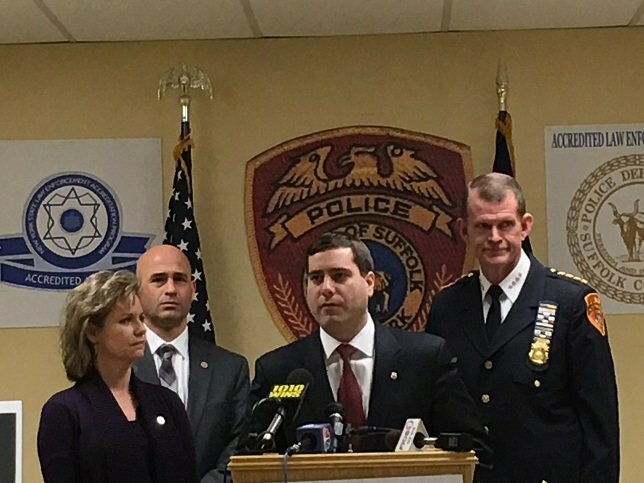 Suffolk County Police Acting Commissioner Tim Sini, alongside Legislator Sarah Anker, today announced a new initiative aimed at cracking down on drug dealing in Suffolk County neighborhoods. Leg. Anker alongside Suffolk County Police Acting Commissioner Tim Sini to announce a new police initiative focused on grassroots efforts to crack down on drug dealing in Suffolk County. Suffolk County, NY - January 30, 2016 - Suffolk County Police Acting Commissioner Tim Sini, alongside Legislator Sarah Anker, today announced a new initiative aimed at cracking down on drug dealing in Suffolk County neighborhoods. The initiative, fueled in part by residents’ complaints, will focus on combatting drug houses in communities. As part of the initiative, the police department will be utilizing Special Operations Team (SOT) detectives in each precinct to work with residents to obtain information on who is dealing and where. Armed with that information, detectives will be executing more search warrants of drug houses and making felony arrests at those locations. During the past several weeks since the initiative began, investigators have already executed nine search warrants and seized approximately $300,000 in cash, approximately 2,672 grams of cocaine and crack/cocaine, approximately 464 grams of heroin, 80 grams of oxycodone, seven guns, and drug paraphernalia. Subject: LongIsland.com - Your Name sent you Article details of "Suffolk Police Combat Narcotics Epidemic in Suffolk Communities"